Everywhere we look, we see problems, but no solutions. People are pointing fingers and blaming politicians, while politicians spend most of their time blaming each other. 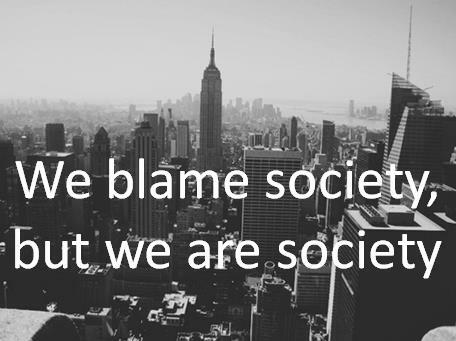 Instead of blaming one another, what the world needs now is for human beings to take self-responsibility. Every four years, presidential candidates promise to do this and that, but once they get into office, the first thing they always do, is to grab more power. Why do we need presidents to tell us what to do; why can’t we the people make decisions for ourselves? Millions of people are suffering from air pollution because the electric company refuses to take responsibility for the pollution that they create. They point their fingers at the people and their dirty cars and motorcycles. But, what if twenty-million people decided to stop buying that company’s other products? I bet the electric company would suddenly decide to burn cleaner coal. Hell, they might even decide to go green. The education system wastes students’ time by forcing them to memorize so much useless information. The parents don’t know what’s going because they are too busy working to pay for cram schools to teach their kids because the government schools can’t seem to do it. I say, if students want to change the education system, they are going to have to stand up demand to exercise their creative potential, at home and at school. And what about this crazy idea that, 99% of the people have to slave forty, fifty and sixty hours a week just to survive, while one-percent own almost all the property and get to live like kings and queens? I say it’s time to end wealth inequality and redistribute the resources equally. Unfortunately, nothing is ever going to get fixed until each one of us take responsibility for getting it done. What is my responsibility as an Earthling? My ability to respond = my response-ability.